Our October meeting featured the final Peter Tea presentation of the year. 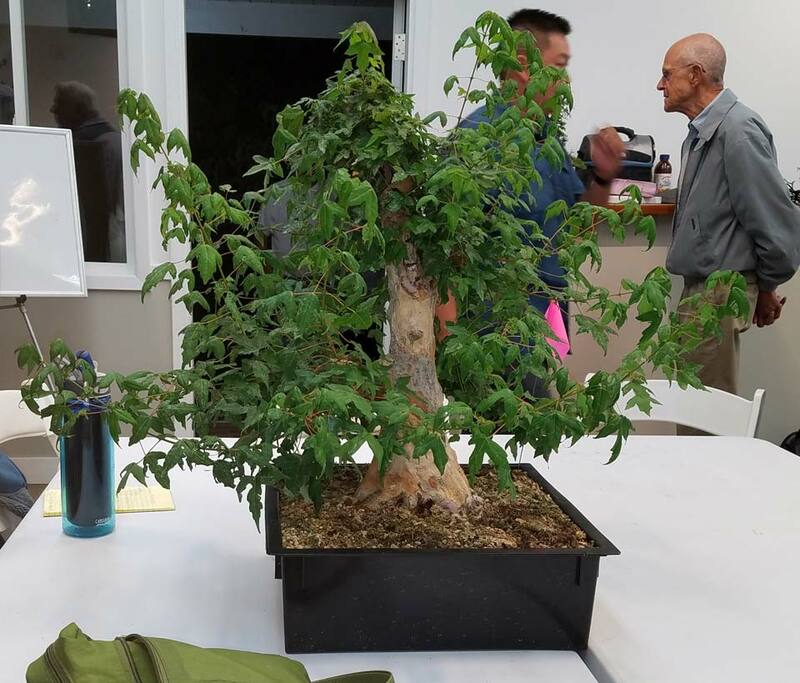 For demonstration purposes, he brought two trident maples, a cascading cedar, and an Itoigawa juniper. The taller of the two tridents was the same one we’ve seen him work on a couple times before. The other was a shorter, stockier trident that we’ve only seen briefly in prior presentations. The conifers he brought to discuss overall style and pot-choice issues. Having seen Peter work on the taller trident twice before over the past year really helped the assembled audience see Peter’s plan taking shape in the tree. The frequently trimmed top was beginning to look more ramified, with lots of division going on in the branches, and the untouched lower branches had grown very long with some obvious thickening occurring close to the trunk. Because he wants to continue to thicken the lower branches, Peter’s light trimming this evening was limited to the top of the tree. Focusing on an area where he had done some prior pruning and wiring, some of it in front of us back in August, Peter pointed out that many of the littlest branches were new just since then. He had already done some trimming in the intervening months, and proceeded to do some more. His goal was to select promising branches and trim out the unnecessary ones. If the branches to be kept had nice short internodes already, they were left alone. Branches that were growing too quickly, with undesirably long internodes, were cut back to the point where they last had a nice short internode length. This method ensures division and ramification in the tree’s top and diverts the tree’s energy to other areas where more vigor is desired, like the lower branches that still need thickening. To review: an internode is the distance between sets of leaves on a branch, the points where the leaves come out being the leaf nodes. Peter was aiming for internode lengths on the order of half an inch in the top of the tree. While making his modest and highly selective cuts, Peter starting reviewing the other ways to get shorter internode lengths (manipulating sun, water, fertilizer, the soil and pot used, and the repotting interval), because cutting alone won’t get the job done. It’s also important to pay attention to those other means, Peter said, because a tree can be overworked. You cannot rush a tree with radical pruning to get it where you want it in the long term. Look for what the tree will allow each time you choose to work on it. And give it sufficient time between sessions to regain its strength and react to what you did. Also, as Peter has mentioned many times before, you must base the level of work you can do on the vigor of the tree. When he first attacked this tree last year, it was super-vigorous, which allowed him to prune it as aggressively and extensively as he did. You would never cut that much from a more developed, balanced tree. If you weren’t there to see the spectacle, he chopped off at least two thirds of this trident the first time he worked on it with us. Largely because he had to nearly obliterate the top in order to stimulate growth in the bottom. Two other tips Peter gave us while working on the taller of his two tridents: First, don’t bother wiring new branches on fast-growing trees that are undergoing major development, unless you have a really good reason or really need the practice. Chances are you will be pruning off that branch within the year, so don’t waste your energy. You’ll probably get a couple more rounds of cuts on that branch before it thickens far enough to require wiring (but don’t wait so long it gets too stiff). Also, don’t worry too much about the tree’s flaws as you’re developing it. Some flaws, like sections of trunk that are too straight or without taper, or unsightly branch stumps, will become hidden once you achieve full ramification of nearby branches. Those ramified branches will fill up with clumps of foliage, covering up the tree’s imperfections. Next, Peter turned to the shorter, fat-trunked trident maple he brought with him. He didn’t spend much time on this one, using it mostly to illustrate a couple points. This tree had branches that had been cut a little earlier on than those we examined on the previous tree, so Peter was able to show us what the next stage of development looks like. It was possible to see where a branch had gotten thick enough and had been cut, was dividing, and was now ready to be cut again for more division, or let go if the design called for it. Because he no longer needs to beef up two important lower branches, Peter said that next year he will be moving this trident from its current enormous growing box to a more-typical smaller box. He also noted some areas on this tree that would benefit from grafting. He concluded his deciduous portion of the evening by saying that anyone who wants to properly develop deciduous trees on their own will eventually have to learn how to graft. Plans are already on the table to make this the next topic Peter will cover when he returns next year, so stay tuned. But that’s not all for the current presentation. 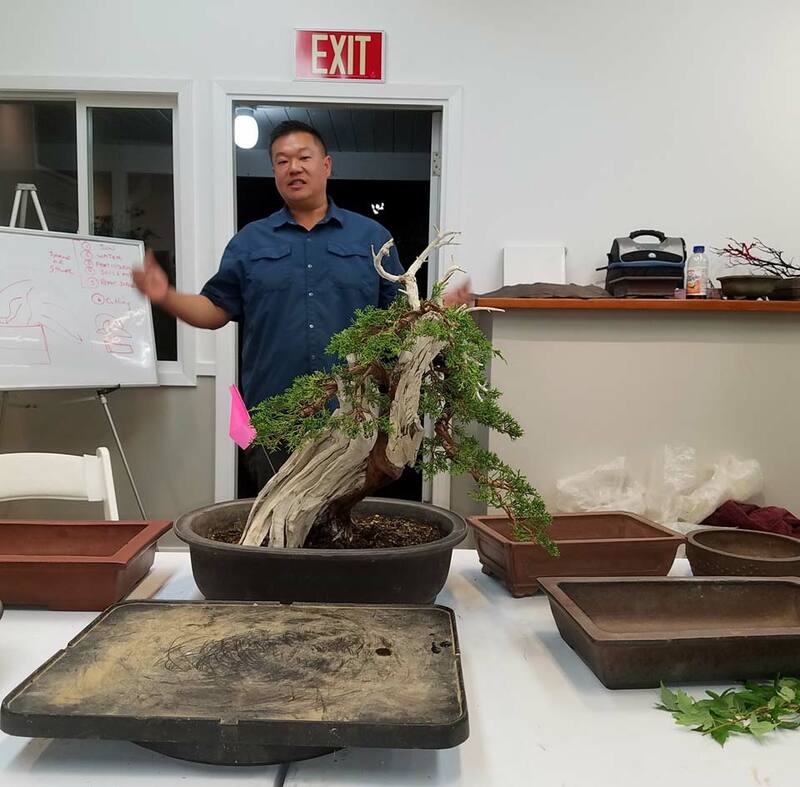 Turning to the conifers he brought, Peter showed an Itoigawa juniper that is in development. 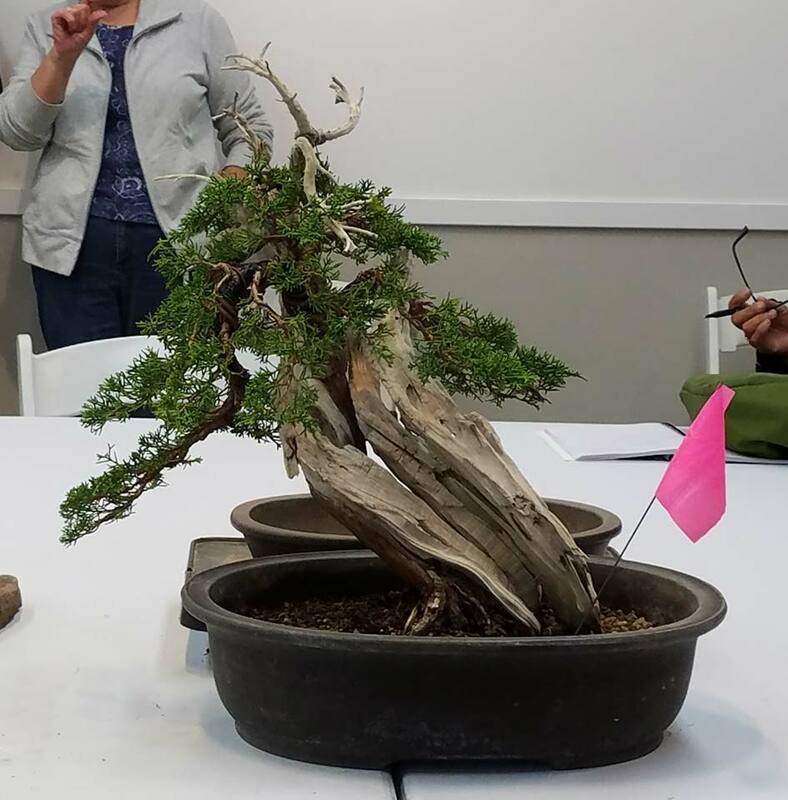 It had been grafted onto California juniper stock, with nice deadwood, and had some roots grafted onto it as well. Peter’s current project with this tree is to transform some of the individual foliage pads into multiple pads, a characteristic that is associated with maturity. Again, ramification. 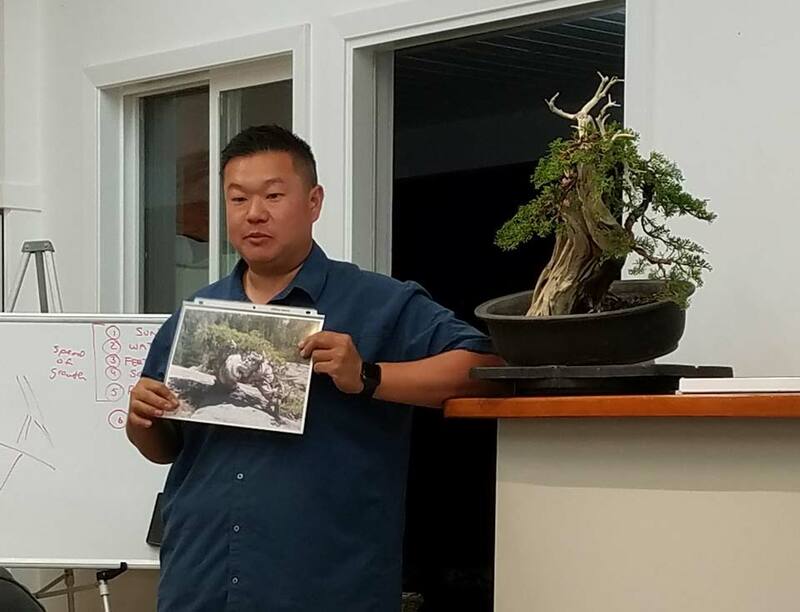 He talked at length about mimicking the movement of natural trees of different ages, and handed around printed photos of examples. For the remainder of the evening, Peter paraded a great number of pots by us, all contenders for the next pot to contain the Itoigawa. The first two examples were a clay pot shaped to look like an enormous rock and an actual rock slab. Peter prompted the audience to comment on the various pot choices and explore the reasons why certain pots were good choices and others not so good. 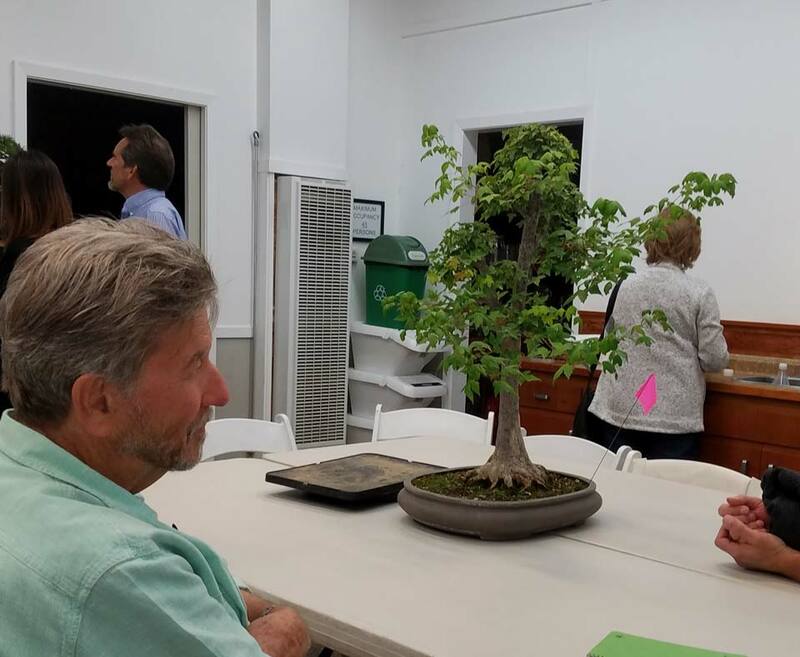 Clearly I was not the only person intrigued by the rock slab idea, as Peter was moved to talk a bit about how one plants a tree onto a flat slab. 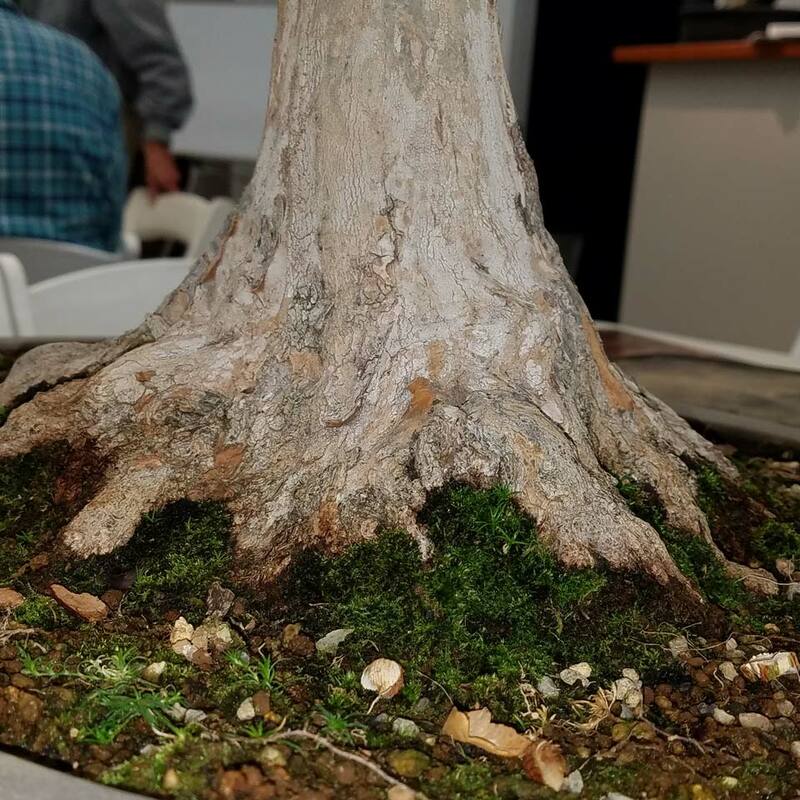 If you haven’t heard of “muck” before, then you need to start there to begin to grasp this type of bonsai. It’s a special clay-like mixture of dirt, water, some fibrous material, and often manure that’s used to essentially stick plants to rocks. In the case of a slab planting, you build a short wall with muck to contain your soil, and then cover everything with moss when you’re done. That brief description skips a lot of middle stuff, like anchoring wires to the rock with various methods (Peter mentioned an intriguing instant glue and cement powder concoction), but that’s why coming to the meetings is so important! Large pots, short pots, wide pots, narrow pots. He went faster as he began to run out of time, but Peter had us analyze A LOT OF POTS! At one point, one of them was small to the point where the deadwood on the tree would hang out of the pot, but Peter said that is OK. He made sure to qualify with a short discussion of pot offset—the way a tree must be positioned in the pot such that negative space counters any exaggerated features like trunk curvature, windsweptness, or as in this case, something asymmetrical like a large chunk of deadwood. One of many other tidbits of information he gave during this whole process: more lines on a pot always make it look heavier. We never got time to have a close look at the cascading cedar. 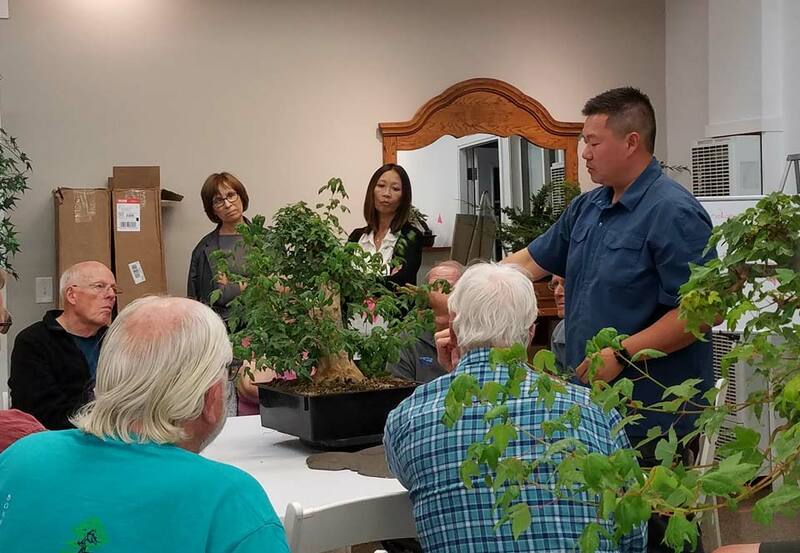 He only had an opportunity to tell us it was awaiting a new cascade pot and gave us a little information about the difficulty in finding good cascade pots, and especially the problems transporting cascade trees. He also took a moment to show how a point of development he had mentioned at an earlier presentation had actually occurred at one of the forward-facing points of the middle part of the cascade. Look at the nebari on that Trident! This entry was posted in Meeting Recap. Bookmark the permalink.